It's been something like 9-10 months since I last home brewed and with a free weekend, decided I had to do something about that. So last Sunday, I did a little twist on my last home brew, a Belgian IPA I called Closet Hop Head. Giving it more of a tropical vibe, Galaxy hops replaced Cascade while cinnamon spice substituted for coriander. Making snap changes on a whim is part of the fun of home brewing which professional brewer rarely have the luxury for. Can you imagine Ken Grossman waking up one day and deciding to use Galaxy hops instead of Cascade in his Sierra Nevada Pale Ale? I call this beer Tropical Closet Hop Head and here's few pictures the afternoon of brewing along with the recipe at the bottom. I'll let you know how it turns out. My extremely primitive wort chilling method. Time for the yeasts to do their thing! Baseball great Ernie Banks was well known for saying "Let's Play Two!" as part of his infectious enthusiasm and love for the game of baseball. The Double Race series, a brainchild of legendary Runner's World founder Bob Anderson channels Ernie Banks's zest for baseball into the road running arena. It involves a 10k run and then a second 5k run the same morning, the two starting times separated by an hour and forty five minutes. Now what do you suppose Ernie Banks would think about The Double Race? 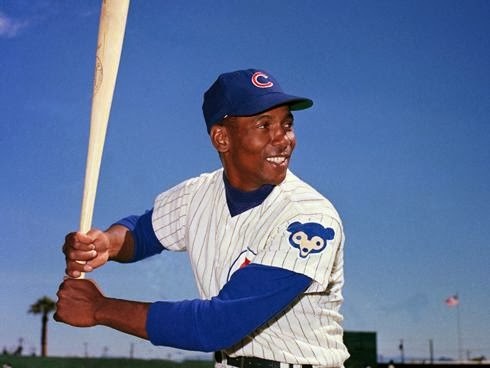 Before you answer that, I should tell you that odds enough, I actually ran a 10k race with Ernie Banks back when I was a high school freshman. Banks retired from baseball 10 years earlier and was there to support the charity putting on the 10k fundraiser. Ernie Bank fleetness on the baseball field had clearly left him by that time, as he slowly lumbered from the starting line after the starting gun went off. At the finish, Ernie Banks was nowhere to be found, suggesting that when it came to running at age 50, Banks was in no mood to "just run one". I was set to "run two" as I lined up last Saturday morning for the 10k to start at The Double Race event in San Jose. Never having run this type of event before, I was like a lot of runners, totally unfamiliar with this novel concept and guessing how to best to pace myself. Should I run the 10k as hard as possible and try to survive the 5k? Or hold back in the 10k and lose some time on those running it hard, but make up for it in the 5k? I settled on a strategy of trying to make the first 10k as boring as possible. That meant no big moves or accelerations, very little racing, and to just go out and hold a consistent pace around my estimated anaerobic threshold to keep my legs from getting too worn down and saturated with lactic acid. The good news is that's basically what I did. The 10k course consisted of two 5k loops around a South San Jose industrial park and I hit the first three miles in 6:15 pace coming through the first 5k around 19:15. The hill on the second mile of the loop course got to me the second time around, and I slowed to something around a 6:40 mile on mile five. Recovering on the downhill to the finish, I caught a couple people who were huffing and puffing like steam engines, suggesting my even pacing strategy was paying off. One of those I passed looked like he was a fellow member of one of the old guy age divisions, so I started pushing a little to put some extra distance between us. Coming through the 10k finish in 38:55 was not as fast as I was hoping for, but it was still good for 13th overall at that point. 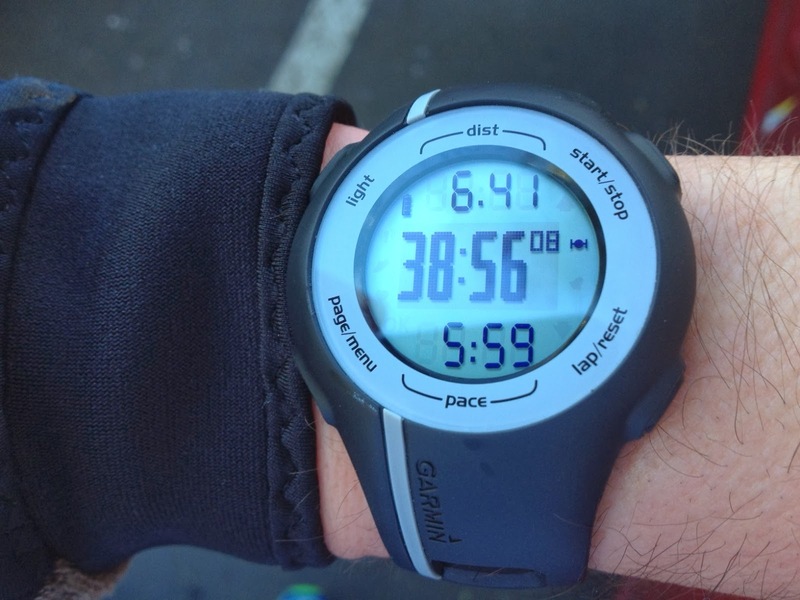 I was feeling pretty good about how I set myself up for the 5k in a little over an hour. 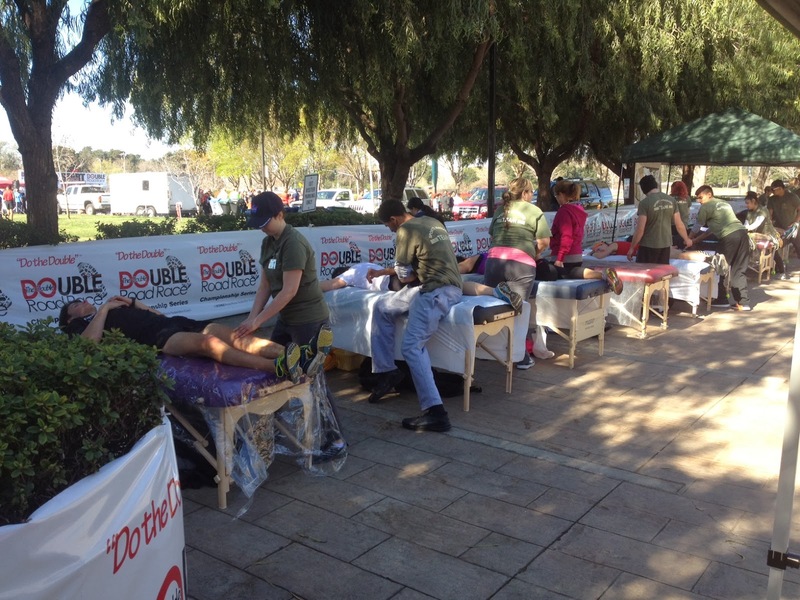 The Double Race had a Recovery Zone which, in addition to water, fruit and other snacks, was full of massage therapists and physical therapists with various gadgets and do-dads eagerly waiting to knead, compress, and manipulate tired running muscles to get ready for the 5k. Having other ideas, I grabbed a bottle of water and a banana and got myself out of there. As good as a massage sounded at the time, it's not something I normally do to recover, and this didn't seem like a good time to experiment with recovery aids. I just kept walking, hydrating myself, stretching and jogging around for the next hour finding way to keep loose, burn off lactic acid and kill time. Surprisingly, I was feeling pretty good as the 5k start rolled around. With 10 minutes to go, I started grooving to the Creedence Clearwater Revival songs the band was playing while getting ready mentally ready for the 5k lactic acid extravaganza. The increased tension in the air throughout the starting line for the 5k compared to the 10k was palpable, and as the horn sounded releasing the field for the final 5k, everyone charged off the line. I was gasping for breath trying to hold a six minute mile pace. Virtually all of my training over the past few months, geared towards a half-marathon, had been at a slower pace, so I just tried to hang on and keep the legs moving kept this up until the hill at mile 2 when I really started dragging. Getting over the hill and pushing hard downhill to the finish, I tried to pull away from this younger looking guy and thought I had him, until he put on this incredible finish over the last 100 meters and crossed the finish line just in front of me, where he promptly collapsed to the ground in exhaustion. Give the man credit, I worked the last mile hard trying to pull away from him but he just refused to be beaten. With a 19:08 5k, I again finished 13th overall in the 5k, and the combined time 58:04 was good for 13th overall out of 233 finishers, 1st in the Men's 45-49 division, and 3rd Men's Master (over 40). Afterwards, I did go to the recovery zone and got a really good stretch and even a chiropractic adjustment. I felt so good, I was almost ready to run a third race after that. I said almost. As for The Double Run concept, I liked the change of pace from one continuous long run and the additional pacing and racing strategy and preparation involved with it's broken into two races. A sense of familiarity arose between us as we all soldiered through the 10k, recovery and 5k that doesn't happen with a standard race. Let's Run Two? Why not! Our Beer of the Month is really a celebration of Cellarmaker, a brewery I literally stumbled across in San Francisco earlier this month. In real life, I sell optical test and measurement equipment and came up from the South Bay to attend a big industry trade show a couple weeks ago. 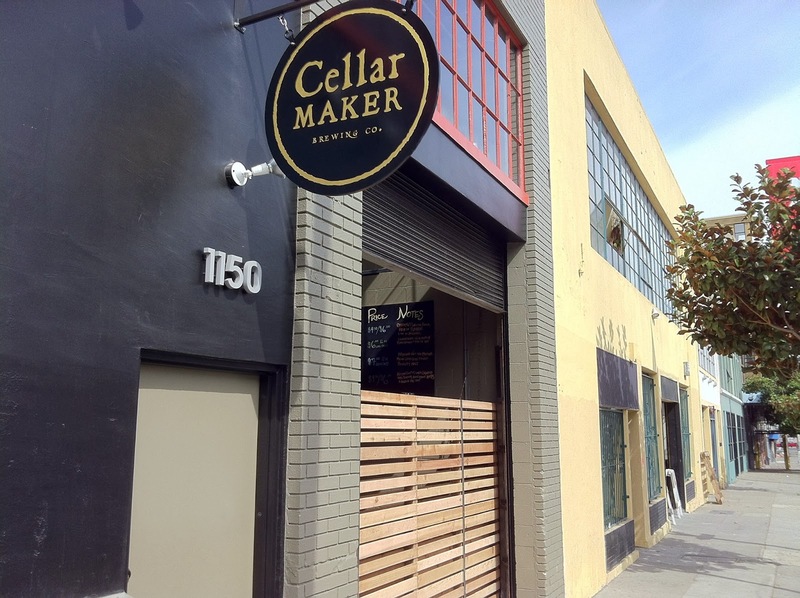 The first day I noticed the "Cellarmaker" sign above a door just around the corner from the Holiday Inn I was staying at on my walk to the Moscone Convention Center. I made a mental note of the place to check it out that evening. Turns out it only opened up about four months ago and with so many Bay Area breweries springing up these days, it's hard keeping track of all of them. Cellarmaker is clearly one you ought to check out and you'll be hearing plenty about. Every beer I sampled at Cellarmaker ranged from pretty good to really outstanding. It's hard to pick a favorite for Beer of the Month from so many excellent candidates, but I'll go with their Southern Passion IPA, a single hop IPA brewed with a hop grown in South Africa of the same name. Rarely does one encounter IPAs with such strong, vibrant hop flavors that is so drinkable. It checks in at 45 ibu's, on the low side as West Coast IPA's go, but the strong melon and bright tropical fruit flavors of the Southern Passion hop really popped like few other IPA's do. Proving once again that despite the zillions of IPAs out there, there are still unique ones to be found. I can't end this post without raving about a few other Cellarmaker beers. I got blissfully lost in "Vastness of Space", an Imperial Stout which was really rich, really smooth, really roasty, and really several other adjectives relating to highly desirable qualities in an Imperial Stout. I appreciated the light sweetness and the fact that it DIDN'T taste like a liquid brownie. Then there was the weirdly wonderful "Triple Berry Berliner". Made with raspberries, blueberries and blackberries, this odd looking dark pink colored brew tasted like more like a fine Belgian sour ale than a traditional German beer. In fact, the berry additions were a nod to tradition, as Berliner Weisse beers in their German homeland are often served with raspberry syrup to compliment the tart wheat used in the brew. Just in case you think Cellermaker are wimps when it comes to hops, their "Original Dankster Double IPA" will hold its own going mano a mano with the best West Coast hop bombs. On a final note, you'll notice few photographs of Cellarmaker's tasting room in the post and the unappetizing picture of Southern Passion IPA above really doesn't do the beer justice. I spent two two evenings at the Cellarmaker tasting room, once by myself and another with a few co-workers. I was enjoying the beer and the company so much, I had no interest taking a bunch of pictures. Sometimes we get lost in Tweets, texts and postings of dubious urgency. Cellarmaker and their beers caught my attention in such a way to make me focus on the wonderful real world right there in front of me. The Beer Walk series has quickly become my favorite beer festival. No, it doesn't have all those hard to find beers, and no, you won't find a bunch of palate searing IPA's or strange concoctions that are essentially weird homebrewing experiments from professional brewers. Instead, in a casual setting, you grab a glass, walk around a small downtown area and sample the beers from all the participating breweries at each participating store. Most of the breweries are local and a many of the beers poured can be found at your local grocery store, but I always find something interesting and new. The fun is really exploring all the little shops and discovering what brewery is providing samples inside. If I have one complaint from yesterday's Beer Walk, it's that Japantown's ukulele store was not one of the pouring stations. I also find these Beer Walks to be great opportunities to chat with all the brewing reps at each location to find out a more about their breweries and upcoming releases. I got to meet briefly with fellow South Bay blogger Brian Wimsett. It's a much more relaxed and varied setting than the usual chaos of a beer festival and both my wife and I have a blast each time we do a Beer Walk. Beer Walks are also great for can posing a beer glass in odd retail settings and to taking silly pictures. So without further ado, here are the scenes from yesterday's Japantown Beer Walk in San Jose. For this month's Session, Oliver Gray encourages us to go in the novel direction of reviewing a beer without describing its taste, mouthfeel, look or giving it the obligatory 1-10 scale rating. It reminds me of two home brews I made a couple years ago. As a tribute of sorts to my eight year old daughter Verona, I brewed a Verona Coffee Porter using cold filtered Starbuck's Verona Blend Coffee added at bottling. Forgive the bragging, but the beer turned out to be a perfect representation of Verona: sharp, sophisticated and vibrant. Encouraged by this, I turned to my next project, a brew for my then 10 year old son Brandon. Brandon is different. He has autism, a disorder that affects at least 1 out of every 100 children born in the United States. Autism is a neurological condition which greatly affects social skills and people with autism often engage in odd and repetitive motions. No two autistic people are alike. In severe cases, a person can be rendered completely non-verbal and perpetually rock back in forth, their mind completely closed off to the world. At the other end of the spectrum are people with Asperger's syndrome, eccentrics with awkward social skills but in some cases, great talent in math, science or art. There is reasonable speculation that Albert Einstein, Michelangelo, and Thomas Edison had Asperger's Syndrome. Brandon is pretty much smack dab in the middle of the autistic spectrum. He talks to people only when spoken to, although will solemnly recite the words from movie trailers and TV commercials non-stop in his own form of soliloquy. He'll flap his arms wildly when he gets excited or stressed and sometimes bursts unpredictably into a carefree state of big smiles and laughter. I catch a few glimpses of my lucid, personable son through the fog of autism, but these moments are always fleeting. For Brandon, I chose to brew Brandon's Maple Brown Ale, since he enjoys Saturday morning pancakes so much. In addition to the standard roasted malts used in a Brown Ale, I added some cinnamon and vanilla, since I add these spices to the pancakes, and maple syrup in the secondary fermentation. When I first tasted the final product, the flavors harmonized unexpectedly into a unique, undefinable brew that unfortunately was overwhelmed by an obvious brewing infection. Contemplating this odd brew, I suddenly realized I had stumbled into brewing a good representation of Brandon. Like Brandon, I could sense a fascinating brew struggling to get out from underneath the suffocating off-flavors. I certainly didn't intend to brew a flawed beer after Brandon, but there it was, an undeniably accurate representation of him in my glass. Bad beer can simply poured down the drain. Children thankfully don't work that way. I always enjoy hearing brewers talk about their beers. The way they describe what they did to create them and how they brought them into the world, many sound like they are talking about their own children. Then there was the time I asked a brewer at a summer beer festival about his wheat beer, and he made a face and nearly sneering, told me "I just brew it for the summer crowd because they like the light stuff ". 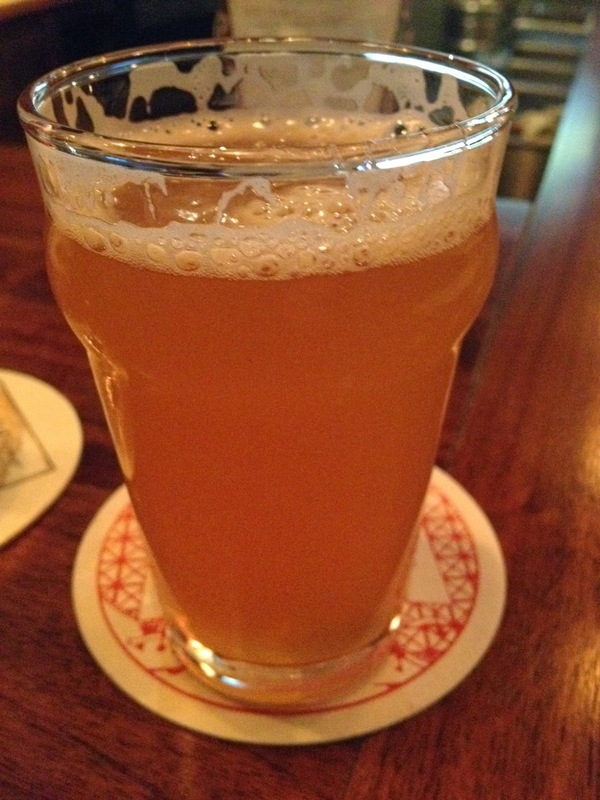 His indifference to his wheat beer showed as it was timid and frail. We've all met home brewers who despite the fact they brew fairly underwhelming beers or ones with noticeable flaws, still talk enthusiastically about them whenever given the chance. Most of us totally relate. We realize a crucial element of the creative process is simply loving what you've created. I work hard with Brandon to help him overcome his autistic deficits, but one of the things I've come to terms with is that loving Brandon means embracing the autism. If you've ever brewed a flawed beer and loved it anyway, I think you'll understand. There's going to be doing a Beer Week run on Sunday the 9th at 1pm. 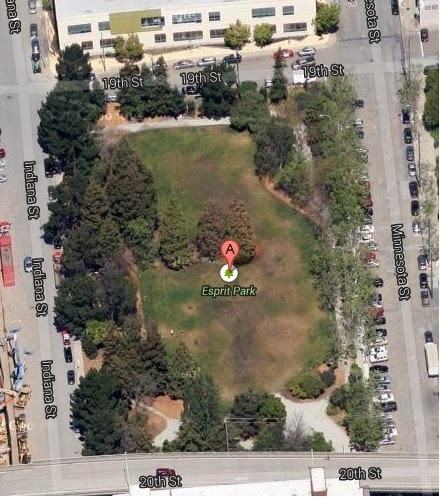 It will be led by the SF Hash Harriers at Esprit Park in San Francisco. You can find more details on the SF Hash House Harriers page here. There will be Strike Beer which is reason enough to go, even for those who don't run at all.